Waves of nostalgia wash over me when I see images of the piggy banks that NatWest has resurrected for its children’s account. In a previous life as (whisper it) an account man at Leo Burnett, I was part of the team that launched the original NatWest Piggy Bank children’s savings account in the early 1980s. And therein lie some of the key experiences that inform not only much of my understanding of managing clients and the creative process but also my career. When I joined Leo Burnett as a graduate trainee in 1981, it was not the hottest creative shop in town. Strongly driven by the account handling function, when the client said “Jump”, we’d ask “How high?” Some of the talented old guard remained, like the late, great Bob Stanners, and there was some flourishing new talent such as Mark Denton, but the agency lacked creative direction and our advertising output was generally pretty undistinguished. Therein lies the First Lesson: without strong creative leadership, an agency is lost. There was, however, one team that stood out for the quality of their work and the passion with which they pursued their ideas: ‘The Two Andys’. I worked with Andy Blackford and Andy Hill on a number of pieces of business, including the launch of the legendary ‘Um Bongo’, a brand for which they not only wrote the launch advertising but which they in fact created. The Andys were the creative team I briefed to originate the brand and launch advertising for NatWest’s two new children’s saving products. They came up with the presciently-named ‘Online’ account for teens and the NatWest ‘Piggy Bank’ for younger kids. For the latter, the idea was to create a physical piggy bank character for each of five consecutive tiered saving levels, incentivising young savers through the prospect of collecting the whole ‘family’ of piggy banks, from little Woody to the family grandee, Sir Nathaniel. The account was a massive success, but the road to its launch was a rocky one. The first obstacle was our client. In the early 1980s, you became the marketing director of a major national bank because it was the next pay-grade up from being the manager of a major branch. So NatWest’s marketing director came fresh from approving people’s overdrafts at the Piccadilly branch. He would proudly regale us with tales of the time he spent sharing a flat with Mick Jagger when they were both students at the LSE, but this was the closest to creativity he had ever been. The ‘Piggy Bank’ was a genuinely innovative idea and persuading him to sign off on the production thousands of ceramic pigs would not be easy. The concept researched really well and we knew we were onto a winner. However, persuading the members of NatWest’s board of the scheme’s wisdom would require them to see the enthusiasm of the ‘consumer’ response with their own eyes. Which is when I was called upon to moderate my first groups. ‘Focus group’ is not a term of which I am fond, but on this occasion it was accurate: the explicit focus was on ensuring we had video footage for the board showing respondents raving about the idea. We set up a couple more groups and my job was to do whatever it took to get the ‘money shots’. The difficulty lay not in getting people to enthuse about the concept, but in getting them to do so one at a time, in coherent, articulate sentences that would cut down into a persuasive 2 minute edit. So, when someone would answer my question about the concept with “Aahh, yeah, I see. Yeah, it’s really nice, that; I can see, you know… I think they’d do that… you know, I can see my lot going for it”, my job was to ask them to rephrase, reframe and repeat their view until it came out as, “I think those Piggy Banks are a great idea: my daughter would love them, it would really make her want to save because she’d want to collect them all.” The group discussion would take on an increasingly surreal air as I asked respondents to express in their own language the words I put into their mouths, or to “just say that all over again” if their comments had overlapped with me speaking. But I got the footage and the edit achieved its objective: the board bought the concept. Of course, this wasn’t research at all. But it gave me my first taste of what research might be like: the thrill of putting a new idea before real people and finding out what they did with it. On this occasion, my brief was not to try and understand what lay behind their responses, merely to get the “right” ones, but it sparked my interest in trying to figure out what it all meant and how it fitted together. The seed was sewn. But in the world of ceramic pigs, there is many a slip twixt cup and lip. The board bought the idea, but they didn’t buy the cost. Producing indeterminate numbers of elaborate ceramic piggy banks looked likely to destroy the margin on the kids’ saving product, so I was despatched to tell The Andys that budget constraints meant the pigs would have to be made in plastic. Sadly, I forgot to don my asbestos trousers and hard hat before going to The Andys’ office to break the news. We had a blazing row, during which The Andys vigorously defended the integrity of their idea, arguing (with rather more passion than coherence) that the cost saving achieved by moving from ceramic to plastic would be outweighed by the decrease in appeal. In the end I had to make an emergency exit, ducking the prototype ceramic pig that had been flung at my head as it smashed against the door frame of their office. This wasn’t my first run in with a creative team, nor would it be my last – after all, when I left Leo Burnett I went on to work with Dave Trott at GGT… . However, the experience taught me a good lesson. 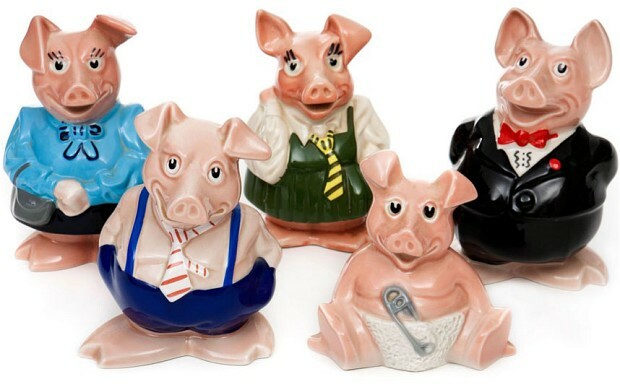 Eventually, NatWest succumbed and the Piggy Bank was launched with ceramic pigs, not plastic. It was a huge success, as confirmed by its resurrection now, 30 years on. The Andys had been right and I had been wrong. I should have recognised that the material the pigs were made in wasn’t an incidental executional issue but was fundamental to the idea, and I should have found a way of persuading the client to come round to the same perspective, without me having to be beaten up by the creative team first. I have never forgotten the critical distinction between idea and execution, nor the importance of holding onto an idea if you really believe in it. The following year I moved on to the bright new start-up agency, GGT. My fellow escapee, John Owrid, memorably nailed our sentiments in the all-staff invitation he sent out for his leaving party, stating that he was “leaving Leo Burnett to start a career in advertising” (I should swiftly add that Leo Burnett is now a very different agency under Giles Hedger!). At GGT I learnt most of what I know about creativity and how advertising works, an education I apply daily in my work as a qualitative researcher. But the ground work was done at Leo Burnett. As dysfunctional as it was, I learnt lessons there I will never forget. After all, the ceramic pig that doesn’t kill you makes you strong. Aside | This entry was posted in Advertising, Brand development, Business management, Communications, Financial services, Qualitative research and tagged Andy Blackford, Andy Hill, Leo Burnett, NatWest Piggy Bank. Bookmark the permalink. Why is Movement like Stormy Daniels?